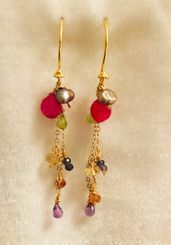 Gorgeous pops of color make these Satori Rue drop earrings whimsical and fun. Hot pink, chartreuse, amethyst, citrine...there's just about a little of everything. Light and easy to wear, they. move and shine.